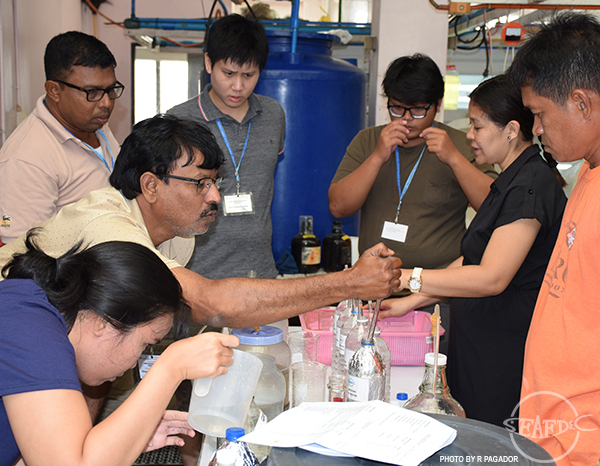 “The training has a personal touch, it’s like learning by doing,” said Chinnasamy Ravichandran, an aquaculture consultant from India who attended the recently concluded 15-day training on “Sandfish Seed Production, Nursery, and Management” here at SEAFDEC/AQD. Antony Vrayen, another trainee from Sri Lanka, took up the training course since his company is developing a 50-hectare aquaculture farm and one of the target species that they will culture is sandfish. “Before coming to this course, I have heard about sandfish, but I have never seen a sandfish. It is only in SEAFDEC that I see the sandfish, touch the sandfish, and ate the sandfish in Molocaboc. It is a very good experience,” he said. The training, also attended by a Thai and Filipinos, included topics on spawning and larval rearing, nursery, and grow-out management of sandfish or sea cucumber. 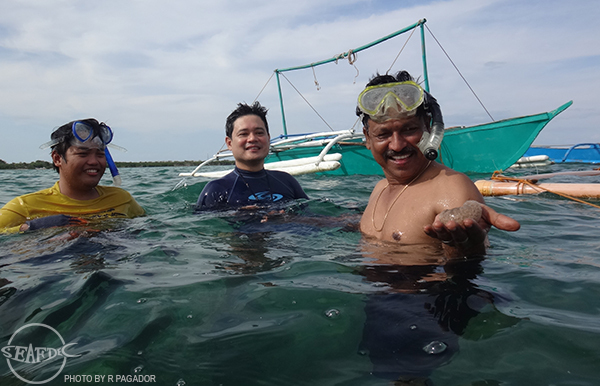 Trainees also visited SEAFDEC/AQD’s project site at Molocaboc Island in Sagay City where sandfish were released to replenish stocks in a marine protected area. “Before entering this course I have zero knowledge, but now I am fully confident [that I can grow sandfish on my own],” Vrayen added. Ravichandran, on the other hand, attended the training to achieve a commercial scale production of sandfish and consider its integration with biofloc technology. “Here in SEAFDEC, I feel very comfortable. The people are very approachable. They don’t mind that they are the course teacher, and we are the trainees. They [SEAFDEC/AQD experts] are very open about techniques, about technology, and willing to share the information,” said Ravichandran. Sandfish, Holothuria scabra, is the most commercially valuable of the tropical species of sea cucumber that are processed into bêche-de-mer or boiled and dried sea cucumber. It is also an ideal species for aquaculture since it can grow well feeding only on organic matter in enriched sediments.